Preheat oven to 325°F. 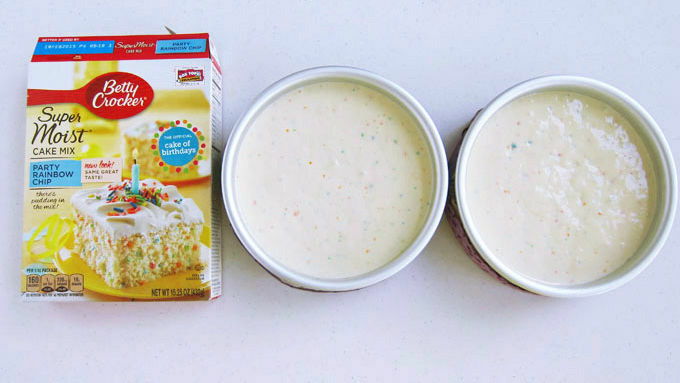 Make cake mix according to package instructions. Spray two 6-inch round cake pans with baking spray. Evenly divide batter among pans. Bake cakes for 45-48 minutes, until a toothpick inserted in the cake comes out clean. 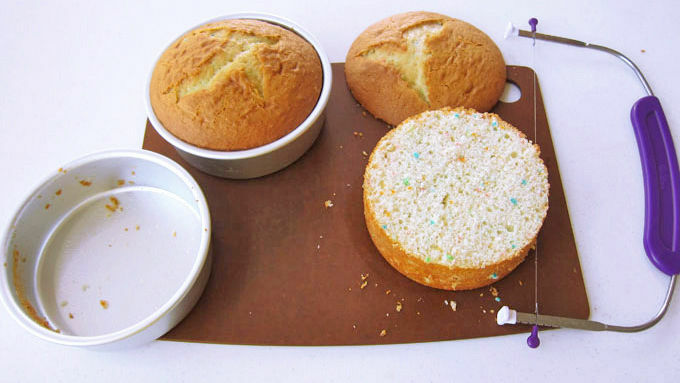 Allow cakes to cool for 15 minutes, then remove them from pans and allow them to cool completely. Cut domed top off of cakes and cut each cake into two even layers. Set one cake layer on a cake board. Frost the top of that layer, set another layer on top, add frosting, and put a third and final layer on top. Frost the entire cake and set aside. Take all the remaining cake and crumble it in a bowl. Add 2 tablespoons of frosting and mix well to create cake ball dough. If needed, add more frosting a little at a time until the dough easily forms balls. 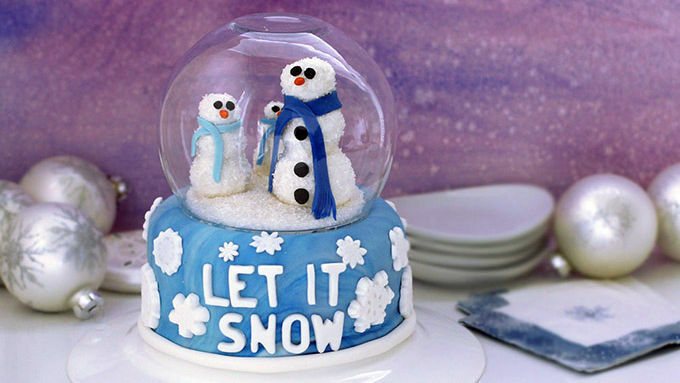 Roll nine balls of dough in varying sizes to make three snowmen that will fit on top of your cake and under the glass dome you will be using to make your snow globe. 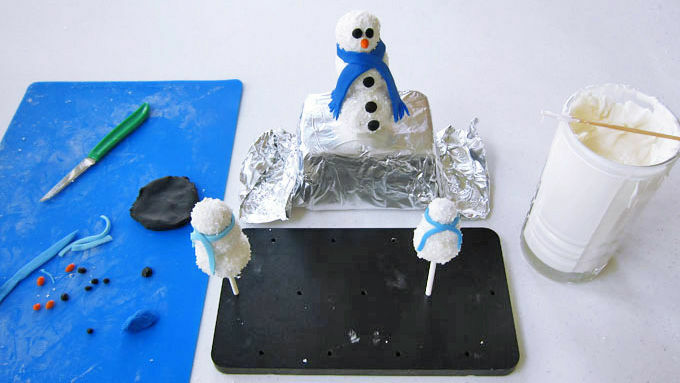 Put each snowman on a lollipop stick using some melted confectionery coating. 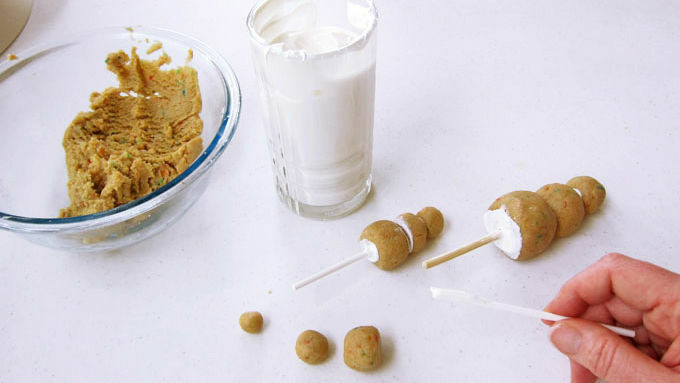 Dip a lollipop stick into some melted white confectionery coating and insert it into the largest ball of cake pop dough. 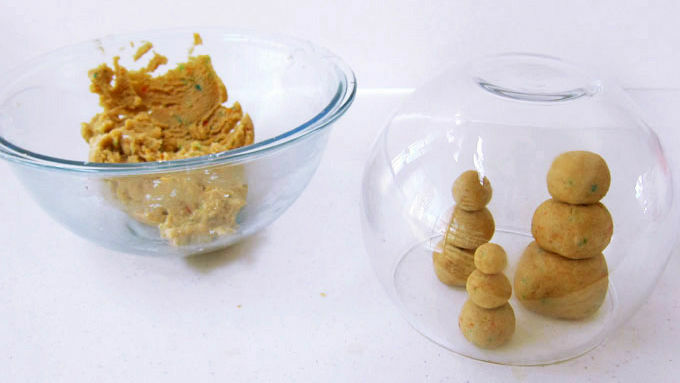 Add another dab of coating and add a second ball of dough, then do the same for the top ball of dough. The stick should not pop through the top ball. Repeat creating all three of your snowmen. Allow that candy coating to dry before dipping them. 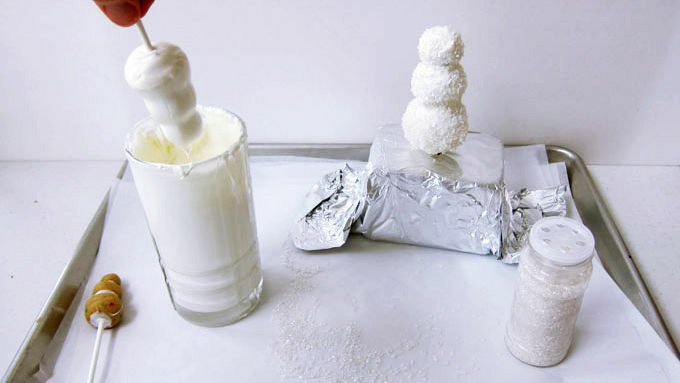 Dip each snowman into the white confectionery coating, remove and allow excess coating to drip off. You may need to run your finger around the grooves to remove enough candy coating to really see the shape of the snowmen. Don't worry about being messy, you won't see it. 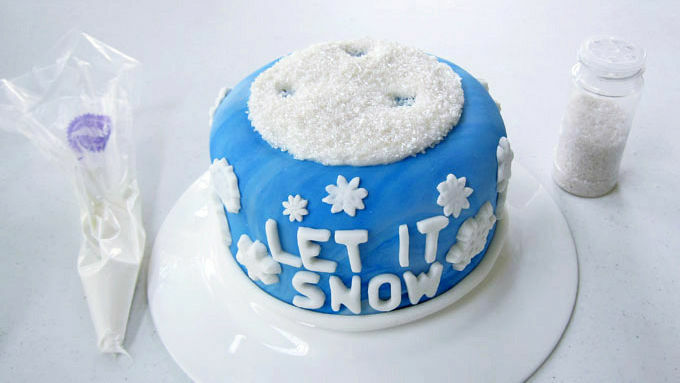 Immediately sprinkle the shimmering decorating sugar all over the snowman. You'll need to stand the pops up until they're dry. You can use a cake pop stand or a piece of Styrofoam. Pop the snowman in the freezer for 3-5 minutes until the candy coating is hard. Repeat, dipping all the snowmen cake pops. 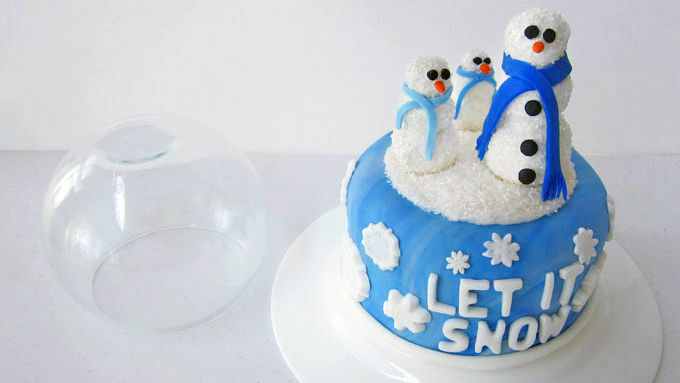 Decorate the snowmen with black fondant eyes and buttons, an orange sunflower seed nose and fondant scarfs. Reserve 2 ounces of white fondant. 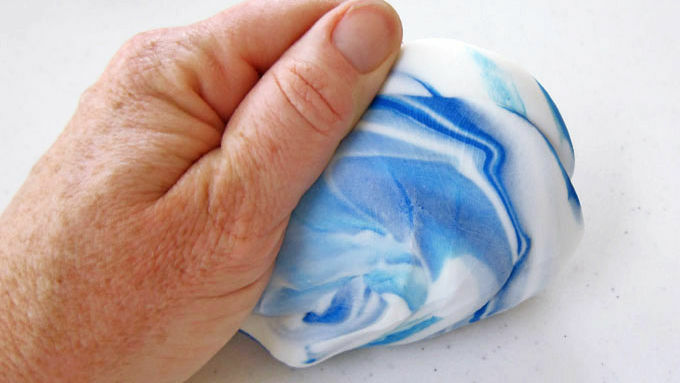 Knead the remaining 12 ounces of white fondant with the blue fondant just until the colors swirl together. 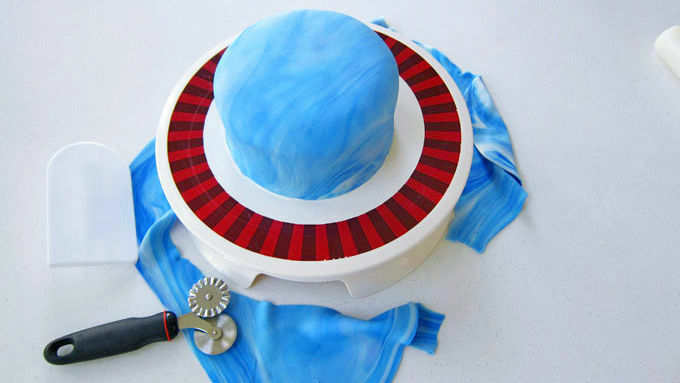 Roll fondant out and cover cake. Roll the reserved white fondant out and cut decorations to attach to the cake. 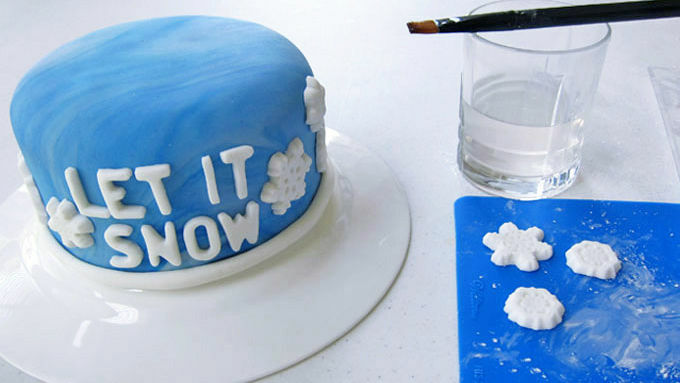 Set glass globe over fondant-covered cake to mark the edge of the globe, then remove. 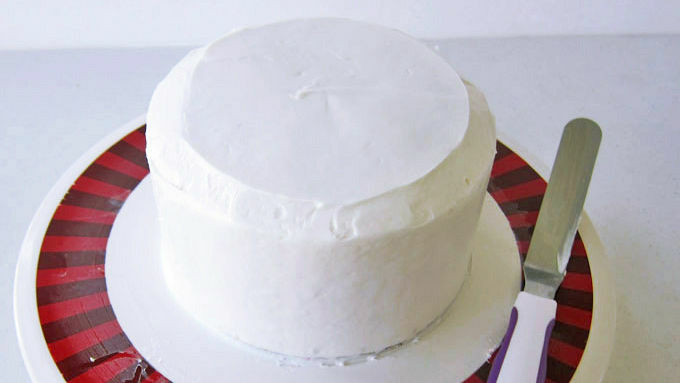 Using the mark on the fondant as a guide, spread white frosting inside the mark. 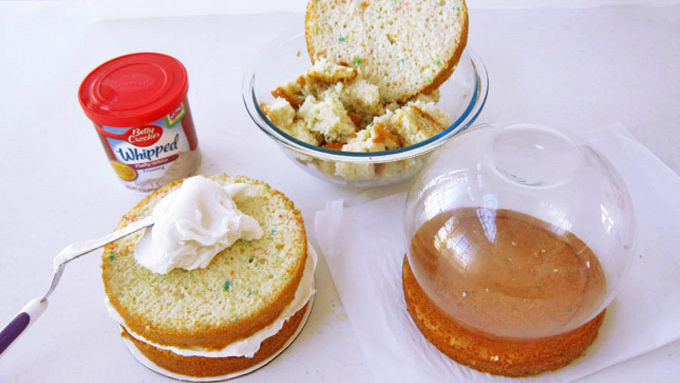 Sprinkle shimmering sugar over the frosting. Insert the snowmen lollipops into the cake, making sure they fit under the glass globe. Just before serving, place the glass globe on the cake.